Agates are semiprecious gems that can be found all over the world, and they are common along the shores of Lake Superior and in northeast Minnesota and northwest Wisconsin. If you're on the hunt for some, the familiar orange and yellow banding is a dead giveaway, but noting the size and weight of a found rock can also help identify it as an agate. Most people can recognize a polished agate, but identifying unpolished agate on a lake or in a freshly plowed field is a little tougher. Making that identification is something that any amateur geologist can learn to do. Look for translucence in the stone. If the stone has been broken and you can see telltale traces of a quartz-like mineral along with the red, brown and orange color that comes with many types of agate, there is a good chance that you have an unpolished agate. Examine the stone for banding. 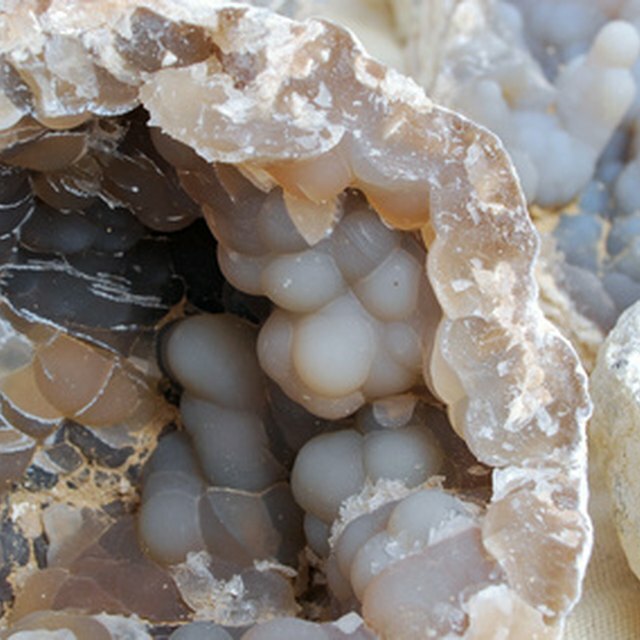 If the rocky exterior of the stone is broken or worn away, check for banding, which occurs in most types of agate. The banding is a factor that is sought by many collectors and jewelry makers. Measure the stone. The average agate is less than 3 inches in diameter. Heft the stone. Most agate pebbles feel heavier than they look due to their dense composition. You may wish to compare suspected agates with other stones that are lying close by. Check for a pit-marked surface on the rough stone. Agates sometimes form in igneous rock, and they might also have been surrounded by softer rock that has since eroded away. Both of these situations can leave the agate with some pitting. Feel for waxiness in the revealed stone. When you see a crack in the stone or a place where the rocky exterior has worn away, slide your fingers across it. Waxiness is a sign that you might have an agate. Study the stone for conchoidal fractures, which are irregular fractures that occur in fine-grained materials such as glass and obsidian. These fractures are often curved, with a wavelike pattern, and they impart an irregular profile to the rock itself. Agates are prone to conchoidal fractures. Use a flashlight to back-light the stone. This will help you find out whether there are any translucent edges that you might have missed. There are many stones out there that look like agates, but aren't. Flint, chert and jasper are all closely related to agate and can have similar banding, but remember that they are opaque, whereas agate is translucent. Ma, Lanh. "How to Identify Unpolished Agates." Sciencing, https://sciencing.com/identify-unpolished-agates-6180873.html. 13 March 2018.